Do you work for SharePoint? Learning about SharePoint? We can help. "Easy to manage web-based client for creating and sharing assets, projects, flows and documents"
I use this program to share important information and critical documents among my colleagues, particularly those who work from home or from another office location at our company. Also, my SharePoint account is connected to my Microsoft Office account as well, so I can view and share my recently opened documents quickly or open one of the applications I have installed on my computer. Finally, the Help tab on the company SharePoint site is quite helpful; and, if that does not work, customer service tends to respond rather quickly to my emails and questions. I feel it can feature more customizable options to improve the way documents are shared. I would also like to see more options when choosing notifications and adjusting those settings. Besides that, I have no other negative comments per se. SharePoint is by far the best program of its type out there. Also, the program's customer service is great. SharePoint allows me, an engineer in the Lighting department, to share time-critical spreadsheets with co-workers from other departments (i.e., the HVAC department). Also, SharePoint allows me to gain quick access to the information published by the IT team or the HR personnel on a daily basis. SharePoint provides me with a sort of dashboard site as well where I can view the most recent company-wide news and have access to key links within the organization. I can also choose who to follow and who to share posts/documents with easily. The best shared services software! "The best shared services software. " The best thing of the SharePoint, is how easy it can be integrated throughout the whole company, and integration of different financial areas. Creating paths and folders, that can be accessed by any user (with access granted by adm) and saving time. It has real time editing, which makes customization better. Perhaps the support could be a little bit more present. We've had a few troubles that support couldn't assist or solve, and that caused a time impact in the company. Also, some areas of sharepoint need a little bit of knowledge, meaning, training is necessary for some type of users. Aside that, nothing more to "complain" about the software. Definitely recommend acquiring the SharePoint, for medium and large sizes companies. Small companies can use too, but i don't think its absolutely essential, since every type of workflow and communication is easily reachable. We are solving a issues regarding communication, such as : a user needs to access to a file that another user has, and that file cannot be sent through e-mail, so we create a folder inside sharepoint, with the file, and grant access for the user, so he can access without any trouble. "Easy to use and access"
I like that I am able to put a document on and share with my co-workers without having to send it in a email and use so much space. It is also great for going back and checking other years. The way we have it set up is by year. So you are able to go back and see what your co-workers have done before you are even at the company. Not all the time does the documents get check-in. And when they don't get check-in then you don't know that they are there. Would be nice to have the documents already check-in after you save and exit out of the document. That is what makes it had with Sharepoint. You are always having to check out the document to edit it and then always check it in. Sometimes also when you check it out it doesn't let you save it with the same name. You have to rename it and then check it back in. Alot of the time people forget to check the document back in. It would be easier is the system automatically checked the document in. It is a great place to save and share documents that your co-workers are able to access. Which in turn will free up space in your emails. It is an easy space to share document with your co-workers. Which then levitates having to send it in an email and using so much space. It is also great for when co-workers are in another building but are still able to help out. I also like it because if you have it set up right you can also go back into different years. That is what is also good about it. Is I can see documents from lets say an event that happened in 2016 and what was done. Otherwise, all you are doing is saving them to your computer. Which then you are always having to recreate the wheel. "Sharepoint is great for storing public files and documents!!!" What I appreciate most about SharePoint is the easy to understand User Interface (UI). It doesn't take much to log in and find any documents your company has stored on the drive. I've been able to find so much helpful information that rescued me from short-notice situations by pulling up SharePoint and seamlessly navigating the tabs. There isn't much to dislike here, another quality Microsoft product as usual. If I had to nitpick I'd say it could aesthetically be a little more modern, but its not about the visuals its about "can you get what you need when you need it?" and the answer to that question is a resounding yes! Give it a try! I stand behind it 100%! Being able to load important documents to a website eliminates so much waste (paper) and allows us to be much more organized as a company. Whenever we feel a need to make changes to any important document, sending a "change request" is a simple and hassle-free process. "Best program for sharing files and paths. " The best of the program is the way to connect areas through folders and paths created by the admin. Also, it has a easy-to-use tool. Simple interface, in order to make the user to feel good about using the program. The support team could be a little bit more present. Had a few issues on programming matters that could be solved faster with a better support team. Also, you need permition from the adm to create or move files and folders to other paths. That makes a little bit more difficult, but doesn't ruin the software. Some big companies use SharePoint because it's the easiest and perhaps the best way to connect areas. Sharing your documents and files with amazing speed and with no trouble, aside the admin permition. The intercompany interests are being solved because of SharePoint. We can connect every single employee through the server, because SP is linked to everybody. "Excellent place to collaborate on team documents"
Its seamless integration with all the standard Microsoft software such as Word, Powerpoint and Excel. It's so nice being able to have multiple people on a team all working on a single document at the same time, whether it's through the online interface or through desktop-based software. The customizability of Sharepoint is also a strength. With some experience, it's easy to create dynamic, engaging web spaces for teams to utilize for storing and accessing information. The online edit seems to overwrite changes that other users are doing at the same time. Although it seems to me that you should be able to have multiple users edit a doc at once (the permissions let you), I have not had much success. I lost all of my work doing so. It could be user error. I recommend to use because is it great platform for document management, safely stored locally on our internal server. It even e-mail alerts me when my team members upload new documents that need to be reviewed. Very versatile and you can even customize it to display project schedules and timelines for your work team. "Great for an inter-company online space; bad for most things custom"
You can make pages and let non-tech people create and manage pages. It's really nice to be able to set up a page for a small group and let them manage it however they see fit without them asking me to do more tasks for them. As with all Microsoft products, the UI is not intuitive and overly complicated. The tools that I would look for would be in different spots and adjusting the settings are different than I would guess. I would define very clearly what you want to use it for and have the salespeople demo that for you so you can make sure it really does what you need. If it can do other things, that's a bonus, but make sure it can do what you need it to do. Groups at work having their own online space. They wanted a space to upload documents, link events, and show other people that need to know what that group does. It really helped to free up developers' time and let more people be in control of online content. Though I have always been a fan of Microsoft SharePoint, one of the best features, of many, is the ability to build and maintain an Intranet site within a matter of 30 minutes or less. Provided how elaborate or robust your Intranet intends to be will dictate the length of time until completion, however, with Microsoft's easily editable fields and pre-formulate add-ons, it is literally a matter of adding what you need and removing what you don't. Though it is difficult to find many dislikes with SharePoint, the one significant drawback I find is the ability for a single Super User to create an Organizational Intranet and invite a specific group of colleagues to participate and contribute to the site without obtaining additionally licensing or granting advanced permissions and sending individual invitations out. Determine how many users will be accessing your organizational intranet prior to establishing paid services to acquire the SharePoint service. As a Standard Operating Procedure Developer, I am utilizing SharePoint's system to build and maintain a master repository to store our organizational operating procedures and HR Operational Procedures. "Using SharePoint is Better than Not Using SharePoint ... Maybe"
The designers seemed to choose to guide users to using the Office programs within the SharePoint online applications, which have limited features compared with MS Office local PC programs. Some of us accounting nerds love Excel, and we spent a lot of time learning it's features. I realize that the goal of most software businesses is to convert users to SaaS - to using online versions with recurring fees - and that's just the way things are, but I don't like the manipulative way they go about it, by making the "download" features difficult to find, etc. Again, it's okay for doing what it's supposed to do, which is being a place where people within an organization can share files, etc., but it could be done a lot better. I don't think UX was well done, or even thought about much. It seems more like net profits were in mind when it was being developed. We were able to share files before, using networking. The calendar is OKAY, but there are other options for that, too. "SharePoint is a fantastic way for a company to stay connected." The thing that I like the most about SharePoint is the accessibility and compounding of ideas and content from any and all employees across various departments all laid out simply and efficiently. It is a great tool for projects, planning, and really anything that involves teamwork. I have not had the opportunity to work out of SharePoint as much as some of my Co-Workers but from what I have heard it is the best option out there with awesome features and capabilities. As long as they continue to update and improve, staying ahead of the pack I do not foresee very many complaints. The problem we solved with SharePoint was the disconnect between departments, SharePoint is a great tool to effortlessly compound ideas and work together as a team. SharePoint is also great because it allows our team to work on multiple projects at the same time without scrambling to find them all from separate platforms. I like that I can upload the documents and pictures I want to send to my team in one space. We use the system almost every day to distribute work and send files to the team. It is very convenient because It can also be accessed through a smartphone. For someone on the go who is always worried about a deadline, this program has helped a lot. I love how communication is expanded by using share point everyone can edit from the same document at once. You cant upload videos that are more than 15 seconds. The file uploads then are unopenable. I get frustrated when I have to send my coworkers a video I have created and it doesn't show up. I wish someone would fix this or create the program to be more upload friendly. It makes it easy to send information to all my employees and has access to all the office apps. I no longer have to send emails to everyone individually but rather I share a file and we can all open it and make edits at the same time. It's very convenient for when we have meetings and use our laptops to be able to share ideas. Time and time again I find myself using this program to communicate. It's very useful to everyone I have used it with thus far! I highly recommend it for small or start-up businesses that are looking for an effective way to communicate with their staff at all times. The ability to access it from anywhere when signed into the company network. If not on the company network, I would be unable to access the company's SharePoint site which makes it more secure. I like that I can access just about everything I need to know about our company through the company's SharePoint site. It provides access to employees from all departments to use one central location. This helps communicate information across the company without the hassle of constant emails and it allows you to access documents you made need without having to track down the keeper of the document. I dislike the inability to access it easily from anywhere however this is what allows SharePoint to be more secure when publishing important and confidential documents for others in the company to access. Overall, the benefits definitely out weigh the dislike as this helps keep company information secure and not easy to access for others without permission. It provides access to employees from all departments to use one central location. This helps communicate information across the company without the hassle of constant emails and it allows you to access documents you made need without having to track down the keeper of the document. "I wish I had this at my previous job"
User friendly. Share point is so easy to navigate that my 7 year old could operate it. The simplicity of the software makes it usable for every type of professional no matter how tech savvy they may be. It’s versatility is the best part and it could be used for just about every industry in some capacity. There really isn’t anthing that I dislike about this software. IF I had to say something negative I would say that there could be a more structured way of how the security of files are handled. I’m a large company anyone could change certain info or add a file into a library accidentally with no measures to catch it. For example, I have an invoice library I use for credit card reconciliation. Some one from another department accidentally dropped in invoice into the wrong place and it causes confusion for the process I do monthly. Make sure you utilize all that it has to offer. With every new job that used sharepoint, came more things I learned you could do with it. It is a one stop shop! It puts every employee in the company on the same page. It has both a user and customer facing platform avoiding the need for additional software and allowing the admistrarors to better assist customers, lessening the need for back and forth communication. It has also eliminated some tasks that were very tedious prior to implanting the program. "SharePoint is powerful. He can do many things and we will not even begin to understand how he can be"
Coming along with other office products is very good. Most people will need Outlook, Word, Excel - it's nice to have access to SharePoint to get our site license. SharePoint is intimidating to begin with. There are many settings and no clear entry point. Creating a new page and linking to that page is frustratingly difficult. Integration with other tools requires certain licenses and this is not obvious. Permissions are confusing. SharePoint offers a variety of features, it can be built to integrate with existing business systems such as a CRM or ERP system. This facilitates access to information by connecting data from different systems. MS SharePoint provides the building blocks for various types of enterprise solutions, such as an intranet, portal, document manager, or collaboration workspace. It is well suited for a project site for which people need to post documents. It's really great if it's set up by someone else, and then it's updated little by little. Our productivity has improved substantially. "Great software for intercompany matters"
The best feature of sharepoint, is that you can share files, documents, information with other areas, creating folders (with the correct access) and paths, in order to simplify the exchange of it. Organization is also something that the SharePoint provides. At my use, i noticed that anyone (with access) can change, delete, or move folders. You also need an administrator, to give the right access, so you can create and organize your work inside SharePoint, and that is a point that need improvement. Hopefuly in future updates. SharePoint is a great method of store information and files. Great, if not essential, for big companies. The best benefit is that i can organize my work easily inside sharepoint. The bad thing of this, is that I need to request certain access for the right people (administrators) and not always they provide. Aside that, SharePoint is an essential software. "Microsoft SharePoint - Collaborating with Ease"
The best thing about Microsoft SharePoint is its collaborative functionality. SharePoint enables all of its users to share files such as documents, photos, videos, and even executable files as long as it is in a compressed folder or a zip file. Microsoft SharePoint also has the option to create surveys that can help you get feedback from your team regarding certain matters. It can also help you create lists or trackers if you need to collate data or information. SharePoint users, with enough permission, can also create personal folders that they can use to store files and access them anywhere within the company's network. That way, any users can have access to their important files regardless of the computer that they use. As a long-time user of SharePoint, I don't have that much of dislikes about the product. The only thing that it needs improvement on is with its security and permission. Files that are being uploaded on the SharePoint can be accessed and deleted by anyone unless permission is set by the uploader. Search functionality for a certain file needs improvement as well. As a workaround, we access the SharePoint thru Windows Explorer and use Windows Search functionality if we want to search for a particular file. 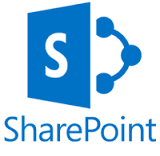 If you or your company requires an application that would help you to collaborate with every member, Microsoft SharePoint is what you need. Our company's network is very secured. File sharing thru network is disallowed and file sharing thru email is very much limited. Microsoft SharePoint allowed us to share files without compromising the security of our network. "Excellent tool for all project documents"
1. Documents kept on this cloud can be accessed by anyone. 3. Can edit documents, add charts, pictures, links etc which helps all the users to explain the subject in detail. 4. External links can be shared through email or skype which helps to share information to large audience. 5. Data is public and confidential both together which makes it unique and stand out from other file sharing softwares. 1. Can be expanded in future to integrate with third party applications like slack, rally etc. It is best content management tool for all the company info. 3.Skype meeting can be passed as it is integrated with SKYPE. "Easy to use when learned, but missing some adjustments"
I most like the easy process of sharing files (uploading, placing, downloading) in a fast way, where it is possible to restrict some folders etc. The interface is quite easy to figure out, as well as all the options there are to contribute to file sharing and editing. I dislike the function of editing a file at the same time as a colleague. Often mistakes happen when several people edit the same file. SharePoint is not able to save all the data registered in the file at the same time if several people are editing and the network is not of very high quality. Furthermore the search function does not always seem to work. I am ot sure if this has something to do with something internally in our company, but I have several times seen that the search function does not work properly. Think about what information you share with SharePoint and how you edit it. Unfortunately it is possible to lose data if several users are editing at the same time. We share information through SharePoint without having to be on the phone, text or send email. We share important documents and sheets throughout the whole company. This is important and helps everyone in the company to know exactly what we are working with. It is a form of passive information sharing and it is easy for everyone in the company to use. It puts every department in the company in one simple spot! I can easily access other department files or phone numbers. Current events are posted, as well as the ability to upload info to each department's page - allowing for everyone in the office to have access to all! Sometimes, it can be a little difficult to move things around on a specific page - but it's not a deal breaker! Once I spent a few minutes searching around the page, and using the help functions, I was easily able to figure out how to edit a page I was working on - and organize it better! SharePoint is an awesome product to use in larger companies that may have several departments with a number of employees in each. It allows everyone to have access to each department - and their current events and files, as well as giving an overall good feel about the company! Putting every department's info in one place that everyone has access to! - It is a very useful tool. It easily sync’s all the data files from your device like from Desktop, Downloads, Documents and every other profile to Share point. - It immediately syncs everything to cloud from internal storage. - When In some scenario such as system break down or need to create profile on another system in such cases we just need to create a new profile and sign in and this is how they can have access to all the files which was synced. - There is both month to month and a yearly subscription plan is available. - It is an affordable cloud-based backup service tool. - In our company, we use Share point to share training videos with everyone in the organization. Share knowledge, information and many other important documents. - not good for Small scale organization. - There will be more security while login and more information should ask when asked for identification process. 100 % recommended for Large Scale organizations. Office 365 Provides 1 TB Capacity per account We can also access all the folders from a Mobile Application too. Which is also aligned with web application and very easy to use and understands. "Sharepoint - Being connected as a team"
The best feature of Sharepoint is its capability to create, store and share documents, videos, audio, and photos with your team anywhere you are. It can also be used to create sites, pages, libraries, surveys and list that are very useful to the company for whatever various reason. Aside from those, Sharepoint can also be integrated into Microsoft Teams and other Microsoft products such as Skype for Business and Microsoft Office apps. It also has a mobile version and a web version of it so you can access it anywhere and anytime. The only thing that I disliked about Sharepoint is when it upgraded to the latest build/version. Before we can open a .mhtml file directly from Sharepoint to a browser. Now, SharePoint will download the file to your computer which will mess up your web page particularly on embedded images. Aside from that, the other thing that Sharepoint can improve on is on file/folder permission. If a person is not used to using SharePoint and how to set permission on a file or folder, his/her file or folder can be accessed by anyone with Sharepoint. SharePoint would help you and your team work together. It would also give you the opportunity to ask other people's opinion or insight regarding a particular discussion. Before, one of our challenges is collaboration. We usually do it the manual way wherein we have to share a file manually to work on it collaboratively. Now we just have to create a library for our files and provide the link to any person who you want to work on the file. I like that I am able to create a document and share it with my team so that they can all collaborate on it. We use it a lot for excel documents where we are working on certain projects and need to go line by line. Everyone is able to pull up the same doc and work together with doing double work. Sometimes it is really slow when you get too much data onto the sharepoint online. We've had some troubles with speed in the past and sometimes if there is too much data you can't do anything with it. Definitely keep it organized and make sure your team has clear expectations on how to use it and what the purpose is. You don't want a ton of random documents floating around that don't mean anything and confuse everyone. We work on projects that involve customer satisfaction. We'll get a report that highlights certain customers and issues they're having and their contact information and put it into sharepoint excel files and then work through it. It is also a great place to store all of the information we have and documents. "The correct and secure place to upload and share the work files and day-to-day activites"
It is very help to share the official files and the day to day activities. And it is a safer way to keep the files and the remaining documents. It will help to know about our other affiliates, what their activities. So that, it is a helpful place to share their useful activities. And, we able to get to know the new changes happening between the affiliates' offices around the World, in the multinational companies, like our company. The Sharepoint is almost good. But, sometimes, we feel some interruption, when we upload big files in the sharepoint, like training presentations, videos, like that training materials. It is a really mess, when we trying to do such kind of uploads. And sometimes, the message will pop up as the space is full, since the half of the space shows as free. those kind of situation make us to annoy. So, please consider in future when the sharepoint upgrade. Who all need to share their official activities and the official files, and office related documents, they can reliable on this platform. And also, it will really helpful to run a multinational company, with strong data sharing. We really enjoying the lots of free space in the local hard disk, since, we are taking backup in the sharepoint. and also, Since we are a multi national company, there is option called, 'whareabouts'. in this, most of the functional and divisional heads will upload their availability on the sharepoint. So that, we able to get know their availability around the World. "A great place for business sharing"
It has poor search capability and the first time I use it, I get a little hard time to get myself familiarize with its function. If you want to use an Business app that gives an ease of use, easy to manage and promotes greater collaboration among members of the team. It offers security features deciding who can participate, what access each participant will be allowed, and how long the SharePoint instance will exist. Every business need to collaborate even if they are not in one big room physically. They need to collaborate virtually with their great ideas to come up with a great innovation. This innovation can help different companies solve their problems and can come up idea which can boosts their productivity. "Office Suite Gets Collaborative HeavyLifting"
The clear, accessible layout of profiles/members and relevant files and events. When looking for someone within your organization, results are quickly listed and finding your data point or document or whatever it may be is achieved within 10 seconds or less, typically. While collaborative/shared info is presented well here, it is not always as simple as within the Office software suite or a full-size browser. The mobile version is going to be slightly condensed for visual and functional simplicity, and while this serves the greater good, it's not quite as easy to use on the go. Having drill-down, long-press, or "Force Touch" capabilities built in would enable more secondary functionality here. If you currently deploy or are part of a Microsoft Office-based or even Windows 7/10 platform, SharePoint is a great cloud collaboration tool. Immediate communication and sharing of documents, agendas/calendars, and grouped team details. Whereas prior we relied upon shared network drives and storage pathways, going to a cloud solution has allowed us to be more time effective, more detailed, and more productive, less redundant. "This program is amazing for manager all documents type"
I like using sharepoint to store various procedures and company documents. In addition to being able to create other types of locations and perform access control. We can access documents stored anywhere as long as we have access to it. For more lay users, it is a difficult tool to use. I believe that more types of training should be available. It is also necessary to have access to the internet, there should be an offline version that when connecting, it synchronizes with the account in sharepoint. I would recommend using sharepoint because it is a stable platform and also because it is in the clouds, being able to access any document anywhere. It allows the storage of documents and procedures of the company, and we can save all kinds of developments. In my company we used sharepoint globally and had no problem whatsoever. Sharepoint is the best tool on the market, in my opinion, when it comes to managing business content for projects that have deadlines and due dates that you don't want to forget. It allows you to upload any document types that are relevant to your project and edit them right within the software. Sharepoint is a virtual environment that managers and users can create, organize, and share any information all in one place. The only thing that I have found that can be a challenge is when you edit excel documents within the SharePoint tool itself. Sometimes the original tools within excel are not available just depending on which version of excel you used originally in the document. However, there is a button that you can export the document back to the original software (excel in this case) and edit then re-import back into Sharepoint. I enjoy using this tool and it helps to connect and interact with coworkers on the project. You can even assign people tasks and due dates which is nice. "Para gestionar de manera optima su intranet"
The best thing about SharePoint is to have a centralized site to share and work in a team with all the members of a project or the company. Creating these scenarios is ideal for an optimal work flow and to be able to organize the information, audit it and always be in movement. It is highly configurable and editable, and several people can work on the same document at the same time. Also very useful is the control that is given to the creator of the document who can modify the permissions at his disposal to edit and read the file. The learning curve of SharePoint is high, Windows should be in I since I consider it a great tool for teamwork. The interface should update it to be in line with the other elements of Office and the functionality could also improve to have better control of the GUI. With the necessary technical training this can be a great product for your company, however consider other more useful options for your intranet market. The best thing about this is the schematization that offers us in the tasks, we no longer need to send so many emails a day with this tool. The form that allows us to communicate and keep us informed on the intranet is very positive, improving times and optimizing work. The availability of information also improves with SharePoint, anyone can access the document quickly only with your Microsoft account. I can customize everything I need for my company. It's an excellent tool that brings in many different software items. It works best for an intranet option to keep everyone in my company on the same page and allows us to work together on items. I also enjoy being able to make it "look pretty." It isn't the same old boring interface you might find with other intranet options. There is a bit of a learning curve, but Microsoft is continuing to make changes/updates that is making it more user friendly. Flows used to be a really difficult item, but they've since made this pretty simple to implement. Don't be afraid of the learning curve or accessing someone to get your site up and running. Once it's designed for what you need, it's an easy and incredible intranet product. Communication and work processes! We can now automate a lot of things that used to be lost in email. requests, time, documents, review processes - everything is in SharePoint now. "Centralized documentation for work groups"
Regarding my experience in sharepoint, there are some elements in terms of administration that can become something, confusing, in the same way for some users, the learning curve can be somewhat more complicated, finally the availability of storage both the onedrive site and the sharepoint that is included in the office suite can generate confusion when storing information for some users. With the necessary training, or with the experience that gives the use of this tool, it can become very powerful, to manage multidisciplinary collaborative environments, which is why I recommend this tool since it can improve workflows a lot. It allowed us to improve the availability and centralization of information in multidisciplinary projects involving several departments of our company, some subsidiaries and suppliers that have needed to get involved. I like that you can create projects within this tool. 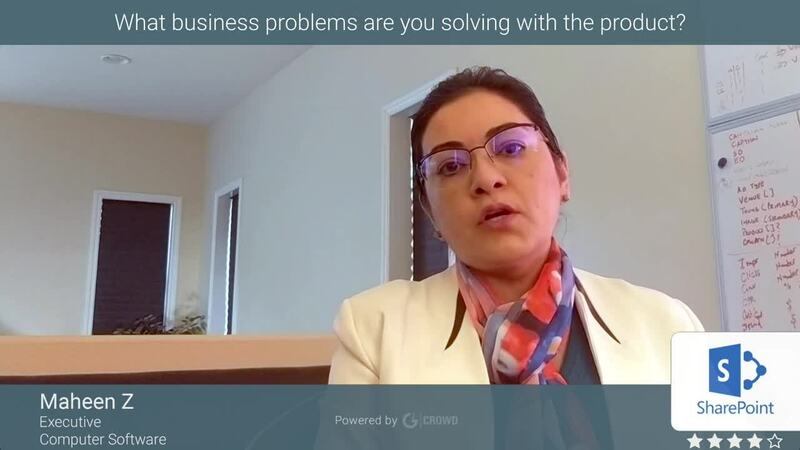 I work with fraud and closely with an audit team and we have used this tool to streamline and organize professional internal audits of how operations are running. I enjoy that you can create checklists and add different steps within the projects. The only thing that I have found that I dislike about this professional tool is that if you save Word or Excel docs within the project, sometimes when you edit the documents it forces you to edit outside of Sharepoint, and within the originating software to have access to all the tools needed. I find this issue to happen frequently within Excel docs that I upload. The good thing is that the software gives the option to edit within sharepoint or the original software used to create the document. I just wish that you could edit within the software with the original functions needed. Within my department we are using this software to help on audits and operational reviews. "Useful Product with an Outdated Model"
SharePoint has some interesting features, the best of which is the ability to share and edit documents throughout the company. You can have several people collaborating on an Excel document at the same time. I can tell my employer to pull up a document on her computer at the same time that I have it pulled up on my computer. You can easily set up all of the different pages to have a unique look and design according to what you are looking for. It is great for organizing documents and is highly configurable, making everything easier to access. It seems outdated. The look and feel of it needs to be modernized, as well as the maneuverability of the site. It seems as though it is still stuck in the version of Office 365 from 2013. It could look much more professional and could be updated with many new features. Definitely try it out. Once you get things figured out and set up, it can be very convenient. Our problem is having a lack of organized documents that need to be accessed by all employees in the corporation. SharePoint is very helpful for sharing documents between employees so that everyone can have access to full information. It is also important for us to move from paper use to electronic use. This reduces waste, increases efficiency, and also improves accuracy and accessibility to our most important documents. "Great Option for Sharing Content"
SharePoint is excellent for sharing documents. They can easily be stored and searched. Being a larger organization with offices around the country, this system proves to be a useful tool for keeping offices connected with resources. Working on projects with coworkers from other offices is now a breeze. The system seems to be very secure. The one area I have struggled with is how closely integrated SharePoint is with Office 365. Any issues experienced with Office 365 seem to often affect the accessibility of SharePoint and its contents. File sharing is the main problem has been made much easier through SharePoint. The search feature makes it very easy to find what I'm looking for without having to look in several other places. I also use the "Frequent sites" feature to easily find where I left off, and to show me recently viewed documents. "Excellent tool for both internal and students users to collaborate on team projects"
My favorite feature is the access control I have as the creator of a document. Also how easy it is to define those permissions the most current version is very user friendly compare to earlier versions I have used. As a student working in teams is great with this tool that is provided for free with our Office 365 Package. I've used it extensively in every project I have done over the past years and never been disappointed. While interning in the IT department I saw the internal value from a security aspect as well. The cost is fairly high for a tool that has many of the same features that Google Docs has for free. If a previous experience was not as good as you had hoped I would try it again because the user friendliness has gotten better an better with each new release of Office 365. Even team members who had no IT experience used the tool with ease after a brief explanation of of its features. I think main concern today is security and that I feel using a tool developed by Microsoft give an added feeling of security over a free tool like Google docs. I know it has been helpful for the users to be able to chat inside when more that one person on the team is accessing the document at the same time. The real-time updates are very cool when working together you can see the work your team member is doing and comment real time if you have a suggestion. "Collect, Organize and Share Information!"